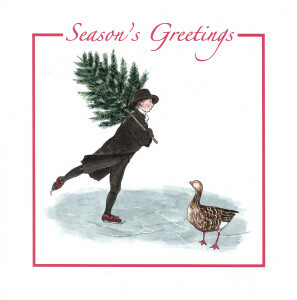 Once more we have Christmas cards for sale based on the world famous “The Skating Minister” by Sir Henry Raeburn on “our” own Duddingston Loch. These are based on original artwork from Susan Mercer of Dr Neil’s Garden Trust. The cards are 60p each or £2.70 for 5 plus package and posting. Please get in touch via info@drneilsgarden.co.uk. This is a very popular Christmas Wreath making workshop in aid of Garden funds and using Garden produce. 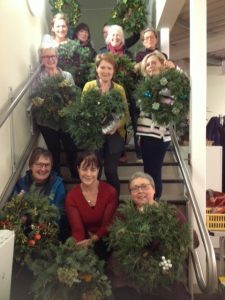 Our excellent instructor, Claudia Pottier will show you step by step how to produce a beautiful Christmas Wreath to hang on your door for the Festive Season. All equipment will be supplied but you are advised to wear an apron and bring some gardening gloves and secateurs. To book a place please either email Barbara Anderson: banderson456@hotmail.co.uk or phone her on either 0131 661 7444 or 07854 748013.